After refreshing my Cydia sources this week, I happened upon a peculiar package dubbed Harpy by iOS developer midnightchips. But more importantly, I was pleasantly surprised after tapping on the package to learn more about it. As shown in the screenshot examples above, there’s not much to the interface, and there’s beauty in simplicity. The lack of complicated interface elements and technical jargon makes using Harpy an easy task for just about anyone. When you tap on a device from the list, you’ll get a pop-up with its IP address, MAC address, and manufacturer name. These details can be used to isolate a device to a specific person, and any unrecognized devices are easily blocked so that they can no longer access the network in question. And in case you were wondering, yes, Harpy lets you unblock network users too. Just visit the “Active Tasks” tab at the bottom of the app to see a list of blocked devices; you can interface with them from there. Notably, the developer says Harpy is built with the unc0ver jailbreak in mind. As it would seem, Electra does not have all the binaries required to run Harpy, so Electra users shouldn’t install it. 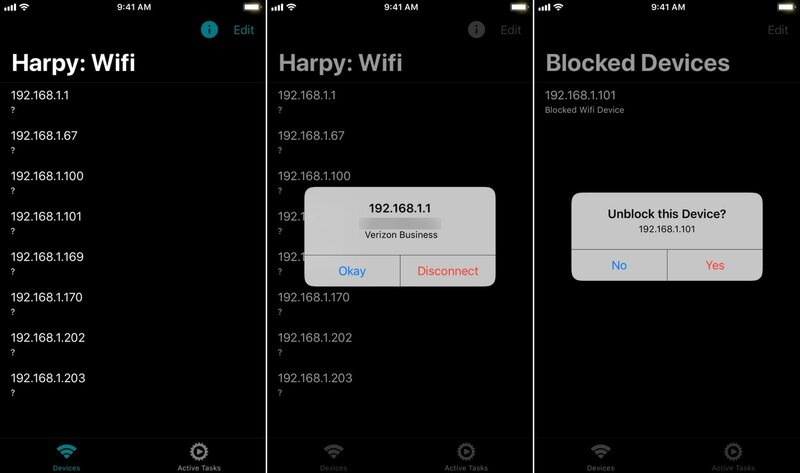 Harpy can be used maliciously on public Wi-Fi networks, and it’s necessary that we advise against this. Blocking communications without explicit consent from the network owner may be illegal, and so you should only use Harpy on your own networks to manage users. At first glance, Harpy looks like an exceptionally-powerful networking tool and can be very useful for taking control of your local network. If you’re interested in trying Harpy, then you can download the app for $1.49 from the Chariz repository. Only iOS 11 devices that have been jailbroken with the unc0ver jailbreak tool are supported at this time. What are your thoughts about Harpy? Let us know in the comments section below.